The Yard Keeps Getting Better! Yesterday we had a great day of sunshine and neighborly happiness with Chris Grant and friends' event Bringing Down the Walls. A couple of hundred people came out to experience the art and music, and we took advantage of the day to make a number of improvements around the site. First things first: a big get-well-soon to Barrington Edwards, who gave us all a fright when he pushed just a little too hard to make his art project happen. Hope you're back on your feet soon! A huge thank-you to the rest of the crew for carrying on the day and making it a success even though we were all worried about Barrington. The good news is that Chris and company had so much fun that they want to make it a monthly event for the rest of the summer. So mark your calendars for July 13, when we'll do it again! If you missed yesterday, you've got some new stuff to look forward to when you visit us next time. Nate Swain has another one of his huge new pieces up (quote of the day: "your walls aren't big enough for my art"). 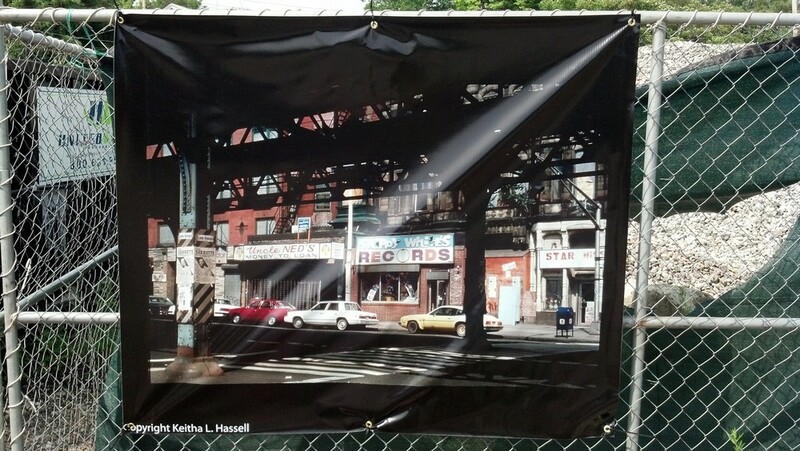 We put up two prints of the elevated orange line from 1986, courtesy of Keitha Hassell. And we are happy to be hosting a new raised bed herb garden brought to the site by Winona and Cassandria Campbell and their friends. We also installed a huge new piece of white vinyl as another legal painting surface. Feel free to paint and repaint this surface. It's intended to be a spot that continually changes, so don't get too attached to any one spot. Do YOU have something you'd like to contribute to the site? Why not bring it to our site cleanup day this Saturday? 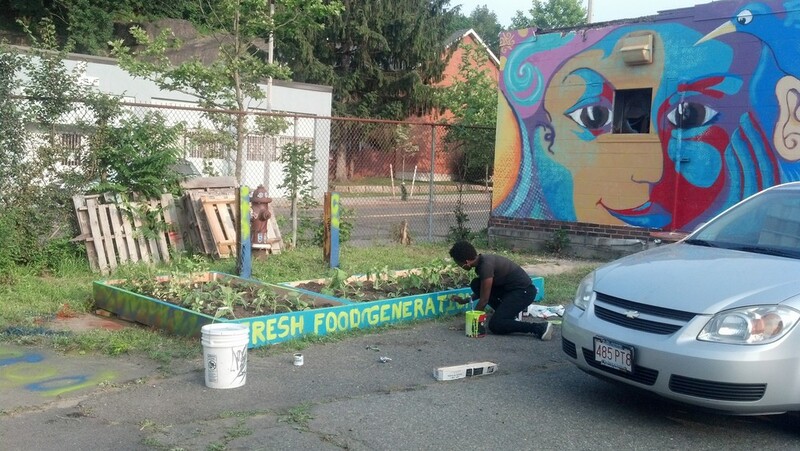 We'll be there from 9-3 making improvements to the space and could use a hand. Please RSVP at the Facebook event page so we know how many hamburgers to buy.